As Arab states and U.S. President Trump align against the emirate, the chance of leadership change is rising. 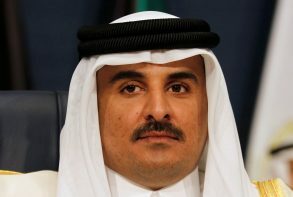 Another reshuffle within the ruling family might unblock trade and diplomatic links without affecting Qatar’s economic prospects. But the precedent would be alarming. The attack that killed at least 22 concertgoers in Manchester is Britain’s deadliest in more than a decade. Its aftermath will dominate the remaining two and a half weeks of campaigning. As in other European countries, economic issues will take a back seat to security concerns. The election of liberal Moon Jae-in to the presidency heralds a softer stance on North Korea and restores domestic stability. That’s welcome. But he will need to unite a polarized nation to succeed where his ousted predecessor failed in resetting South Korea's growth model. Investors are ignoring the U.S. president’s war rhetoric against Pyongyang, snapping up South Korean securities and modestly buying protection against default. Optimism over the global economy and a new leader in Seoul result in a mute reaction compared to past flashpoints. Negotiators for presidents Trump and Xi have reportedly agreed to ease the U.S. financial sector's access to China. It's an easy concession as the benefits will mostly accrue to Beijing: greater inflows of foreign capital, plus help upgrading bond and equity markets. Oil spiked after U.S. missiles rained on Syria. The fear isn’t that supplies will be disrupted but that Syrian ally Iran, which has been increasing its output of crude, will be hit with renewed sanctions. Even if that happens, other forces could keep markets well supplied. Ageing monarchs may hand greater powers to a younger, more progressive generation in 2017. Falling oil revenues and ballooning budget deficits are forcing sheikhdoms to make overdue economic and social reforms or risk financial meltdown. Millennial thinking could help. Pro-Kremlin leaders in Europe and the U.S. plus a rising oil price will embolden Vladimir Putin in 2017. That could lead to a rethink on sanctions and a soft response to Baltic sabre-rattling. Western protests will be limited to threatening boycotts of the 2018 World Cup. Moscow’s ambassador in the Turkish capital has been shot dead by a policeman seeking revenge for Aleppo. In 2015, Recep Tayyip Erdogan and Vladimir Putin were at loggerheads. Now mutual self-interest over Syria and a perceived common enemy mean the shock can be smoothed over. After the last Iraq war, U.S. reconstruction cash poured in. Were Aleppo's collapse to prompt the end of the war in Syria, Moscow's economic fragility would make it unlikely to follow suit. An EU populist backlash against a fresh influx of fleeing Syrians helps Russia anyway. President Santos and FARC rebels tweaked a peace deal that was narrowly nixed in a Brexit-style plebiscite. The new pact looks likely to go to Congress for approval rather than another referendum, a prudent move given voters' inscrutability. The economy needs an end to war. The kingdom's fight against Houthi militants in Yemen is a burden on finances strained by cheap crude. Persisting with its expensive military adventure may require Riyadh to let oil prices rise further. Otherwise real-world battles may spill over into the economic kind. Voters on Sunday narrowly rejected a deal with FARC rebels that aimed to end five decades of civil war. The result shreds the credibility of the president and pollsters. The desire to be tougher on the rebels proved stronger – just – than the appeal of a needed peace dividend.